Reuters - Sri Lankan shares on Thursday recovered from a more than one-month closing low hit in the previous session, helped by gains in market heavyweight John Keells Holdings Plc, although investors remained concerned about communal violence. After days of violence, a curfew in the town of Kandy was temporarily lifted on Thursday. “But investors worry about the violence because it is not settled. It could resurface,” said Prashan Fernando, CEO at Acuity Stockbrokers. The Colombo stock index ended 0.27 percent firmer at 6,521.24, following three straight sessions of declines. Turnover was 733.5 million rupees ($4.72 million), less than this year’s daily average of around 950 million rupees. 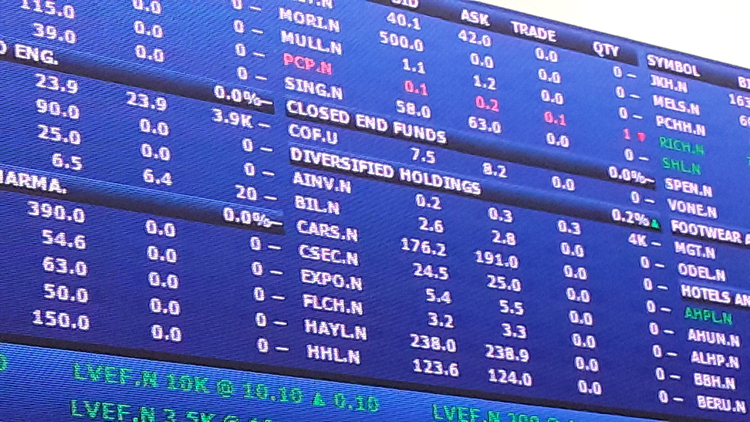 Foreign investors bought a net 24.2 million rupees worth of shares on Thursday, extending the year-to-date net foreign inflow to 6 billion rupees worth of equities so far this year. Shares in top conglomerate John Keells rose 1.4 percent, while Commercial Leasing & Finance Plc jumped 10.7 percent.